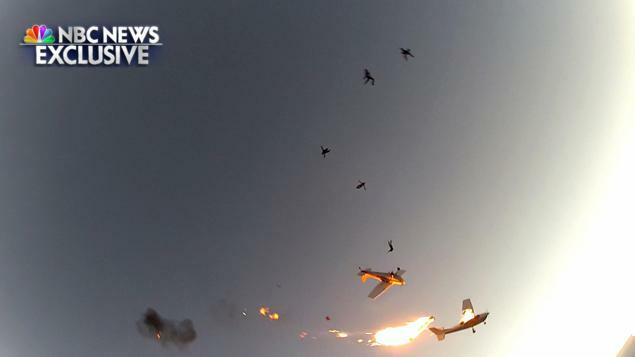 Nine skydivers and two pilots escaped as their planes crashed in midair, turning one of the aircraft into a “fireball”. Four skydivers were preparing to jump when their plane collided with another, carrying five skydivers, at 12,000ft in the state of Wisconsin. All the skydivers safely jumped. One pilot ejected with a parachute and the other safely landed the second plane. The Federal Aviation Administration (FAA) is investigating Saturday’s near tragedy. All of the skydivers were either instructors or coaches who have completed hundreds of previous jumps. Instructor Mike Robinson, 64, said that he and three other skydivers had climbed out on to the step of the Cessna 182 in preparation for their jump. “We were just a few seconds away from having a normal skydive when the trail plane came over the top of the lead aircraft and came down on top of it,” he said. Mike Robinson watched as the aircraft fell in pieces from the sky. The pilot of the plane, who ejected with a parachute that could not be steered, suffered minor injuries. The second pilot landed the plane safely at Richard I Bong Airport, Douglas County. A witness on the ground told the Duluth News Tribune he heard a “boom and looked up and there’s a fireball and smoke”. Braydon Kurtz said one plane “was circling down and one was going down straight”. Mike Robinson said while everyone responded professionally and quickly, they were lucky to have been in place to jump when the collision happened. “It might’ve been a lot worse,” he said.